This Supersonic model contains Bremont’s first ever manual wind movement, which features an 8-day power reserve and has a power reserve indicator at the 12-o-clock position on the dial. With a stainless steel case, limited to 300 pieces, the Supersonic also has the elegant silhouette of Concorde incorporated into the movement. Celebrating the 50th anniversary of an aircraft both brilliant and beautiful, the Bremont Supersonic incorporates parts of one of the most famous and iconic planes in history – Concorde. In partnership with British Airways, metal from the G-BOAB Concorde, known as Alpha Bravo, was donated to Bremont to incorporate into these unique timepieces and has been machined into a decorated ring within the case back design, underneath the crystal. The watch also features a description of the aircraft’s main attributes: number and registration, years of active service, number of supersonic flights as well as her top speed. 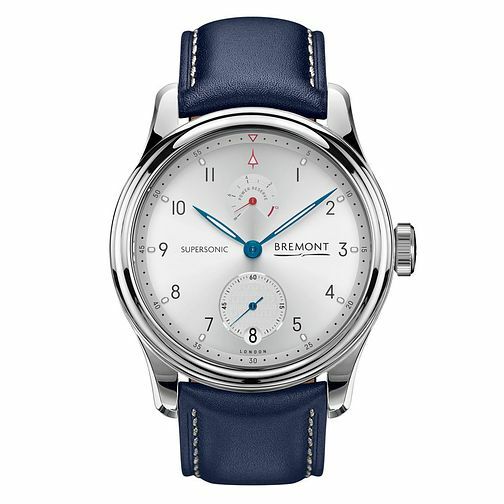 All Bremont timepieces are tested above and beyond the demands placed upon conventional wristwatches.